For 7 generations, the Hatori family has made quality hand tossed pizza in New Chicago. Competing against the other Pizza families the art of making a good pie has gone from an contest to a war, with elaborate and excessive battles between stores for the annual title of Best Pizza in the City. While the other families have changed with the times, some switching to electric ovens, others to machine rolling the dough, The Hatori’s have always honored the tradition of hand tossed and wood ovens cooking. Until their youngest came along. Elly Hatori is a complete fumble fingers when it comes to spinning dough, either though lack of agility or anxiety she just can’t spin a pie in the air. While for a time her family could cope with her inability the loss of her grandma meant she had to be ready to battle in the pizza family feuds. Her grand-uncle came up with a device to let her both fight and make pizzas despite her lack of dexterity, a giant double bladed pizza cutter axe, with built in sauce pourers and even a low flame thrower to cook pizzas on the blade. Although she’s grown quite proficient with the device, her mother and father disapprove since it just doesn’t have the heart a true pizza should have. 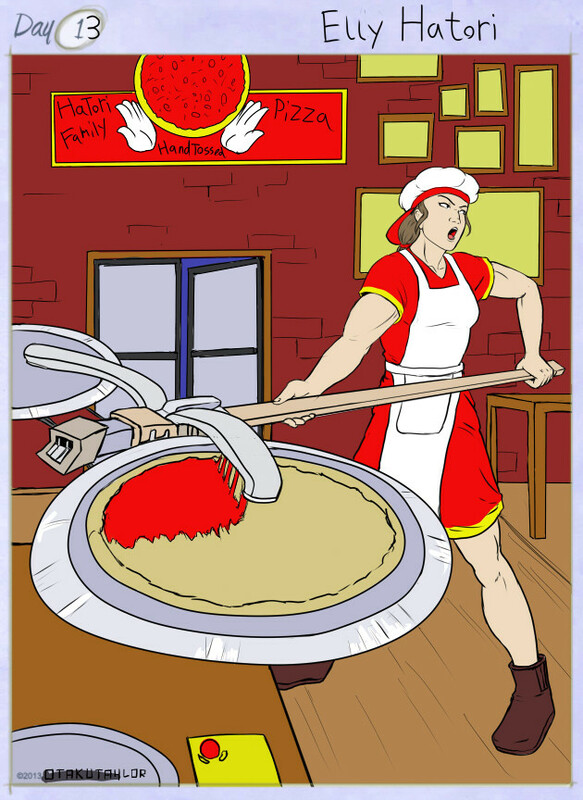 Fortunately, since it’s a pizza making tool, it’s allowed as a weapon in the battles and that’s where she shines, since her parents older styles are being overpowered by newer technologies and techniques.